You would expect that a blog from an artist would focus on the influence and lessons learned from other artists. Sure. I have done that many times. But some of the greatest lessons that I have learned and actions that I have emulated have come from sources far afield from the world of art. Take, for instance, Derek Jeter. As we fans of Derek Jeter struggle this weekend with the end of a glorious era as he retires as the legendary shortstop and captain of the New York Yankees, we are left with memories and a few lessons. The first lesson that I took from the Captain is: Give total effort all of the time. Watching him come to bat thousands of time, I cannot recall a single instant when he didn’t bust out of the batter’s box and run with his greatest effort on what appeared to be an easy out for the opposing team. He knew, as the great Joe Dimaggio had pointed out before, that there were people in the stand who might never get to see him again, who had traveled to see him play and to not give his total effort would be robbing those people of seeing him at his best. And besides that, good and unexpected things often came from this effort– often making the other team hurry, causing mistakes on their part, and spurring his teammates to follow suit and give that same effort. Total effort becomes routine for players like Derek Jeter, acting like a rehearsal. In the big moments, they simply focus and do that same thing they have done every time before. The second lesson is to : Make the most of what you have. This is an extension of the first lesson. Over the last year or so, I have Derek Jeter point out , when asked what he thought separated him from other players, that he knew he was not the most talented player in the game or at his position. But his desire to excel, his dedication to working hard and his willingness to give total effort with each attempt multiplied his talent level. How many times have you seen those with great amounts of talent in just about any field flounder simply because they cannot find the focus or dedication to fully use their talent? Lesson three is: Know who and what you are. This is kind of an extension of lesson two. Play to your strengths and away from your weaknesses, while at the same time trying to make your weaknesses into a strength. Derek had vulnerabilities in his swing early in his career, susceptible to inside pitches. A definite weakness that would be exploited throughout his career if he didn’t do something to change. So he worked and developed an ability to fight off those pitches with a contorted, inside out swing that became a tremendous strength for him. He also never tried to be a slugger or home run hitter because he knew that was not who he was, knew that was not his role on the team. This translates to the art world easily as you often see artists who feel they must be something that they clearly are not and in attempting to do this take away from their real strength. Lesson four: Control your image. Derek Jeter is a master at controlling his own actions and image, on and off the field. On the field, he does not make wild claims or attack other players, doesn’t need to build himself up by tearing others down. He never overreacts, never disrespects other players, umpires or the fans. You never hear wild rumors about him or hear silly comments coming from him. He has used his fame to create goodwill. He began his foundation to aid and educate underprivileged kids when he was 21 years old. Think about that– 21 years old. How many of us would be thinking about ways to help others when we were that age, especially with a million dollars in our pockets and the free run of NYC? He has stated that the foundation will be his primary focus in this post-baseball life. As a result, he has built a reputation based on respect, both for his abilities and his image. Lesson five : Do not be afraid to fail. While Derek Jeter has always seemed to succeed, those who watch the game regularly know this is not the case. Like most players, he fails to get a it 7 out of 10 times at bat. Yankee fans often grimace when he hits into double plays, a result of him always seeming to make contact with the pitch. I have seen him fail numerous times, often striking out to end a game. But the beauty of it is that he puts it aside and instead of dwelling on that failure, looks forward to the next chance to redeem himself. You must be willing to go to the plate and swing that bat. For artists, that means putting your work out into the world, showing it at every opportunity, knocking on every door and dealing with possible rejections. Because you struck out once does not mean that you won’t have hit next time up. That brings us to lesson six: Embrace the moment. This is sort of a culmination of all of the other lessons. Be ready for opportunity and when it appears, step up and take your best swing. Be confident in who you are, in that you have the ability and that this moment is not greater than you. Derek Jeter has done this countless times. In the biggest moments, he seems to make the play, get the hit, score the run– whatever is required in the moment. Last night, in his last at bat ever in Yankee Stadium, he delivered a storybook ending, stroking a game-winning hit with that swing that is oh so recognizable to his fans. You don’t get a lot of opportunities in this life so be prepared and do what you must to score that run. There are more things I could surely say about Derek Jeter. He said that he has achieved his greatest wishes and beyond, more than he had dreamed possible. So maybe I should have said something about creating a vision of what you want to be. Perhaps you too will achieve more than you initially thought possible. It’s going to be hard to not see that number 2 jersey on the field after this weekend. I already miss him but will not complain because Derek Jeter has given me 20 years of baseball that I have loved along with those lessons I have learned. Thanks, Captain. 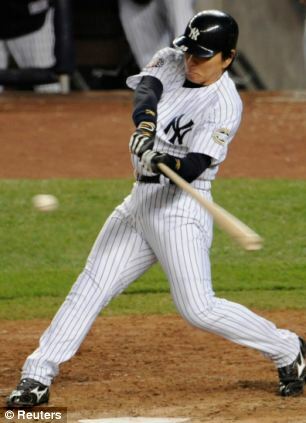 The World Series ended last night with a bang as an aging Hideki Matsui (AKA Godzilla) single-handedly slugged his New York Yankees over the Philadelphia Phillies. He drove in 6 runs with 3 hits including a soaring home run off longtime Yankee nemesis Pedro Martinez on the way to a 7-3 victory. It was the 27th championship in the storied history of the team. It was a really good Series between arguably the two best teams in baseball. The Phillies, last year’s reigning champs, were a formidable opponent and a very likable group that played the game with full effort. They could have easily won any of these games. However, the Yankees were just a step ahead this year. To a baseball fan, the game becomes part of your daily ritual. It’s a long season that spans all four seasons, running from spring training that starts in the last weeks of winter to the Fall Classic, as the Series is called. The Yankees played 177 regular season games not to mention all the spring training games. It is, as they say, a marathon sport based on finding the rhythm of a team and trying to maintain it through the ups, downs and grind of this long year. It very much mimics day to day life. So, you follow your team and suffer through the lows and relish the highs. Being a Yankee fan has had a lot of highs, certainly. But the heightened expectations create deep lows when your team fails to follow through on the promise of their potential. And this year’s team was promising a lot. It was a team that was very easy to like in many ways. I’ve heard fans of other teams say that it tore them up because this team was so hard to dislike. They played hard all the time, played with joy and never seemed to be just putting in the time when they were on the field which means a lot to the day to day fans. When you’re committed as a fan you want to know that your players are as invested emotionally as you in the season. That’s why it’s been a pleasure following these Yankees over the last 15 years or so. I remember reading about Joe Dimaggio saying that he played hard every day out of respect for the fans, that he knew what a big deal it was for many of them to make the trip, many from long distances, just to see the game on that particular day. It might be the only time they’ll ever see you in person and they deserved to see you try to do your best. I’ve watched Derek Jeter day in and day out for since 1996 and he has never made me feel as though his full attention was anywhere other than where he was at that moment on the field. Full effort all the time. Oh, he’s failed. Much more than he’s succeeded. That’s the nature of baseball. But his effort has never lagged. And that’s what carries the fans through the lows. That feeling that though they couldn’t go all the way, they gave it all they had. It’s a good life lesson. And when they give all and win, it’s even sweeter.